The downloadable documents on this site are Portable Document Format (pdf) files. To open them, you need to have Adobe Acrobat Reader installed on your computer. If you do not have the application, you can download it for free. 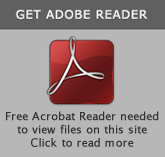 Click on the icon "Get Acrobat Reader". Follow the easy instructions included with the Acrobat Reader software to install it on your computer. Then click any PDF file to view or print it.